Becoming a visiting volunteer is an incredibly rewarding experience that will afford you the opportunity to share your wonderful dog with those in need in the community, to enhance their overall quality of life. The Animal Companions Accreditation process follows established guidelines that will ensure all our accredited teams meet the highest standards. As ambassadors for our organisation, volunteer teams represent Animal Companions in hospitals, nursing homes, special needs facilities, schools, and at public events. 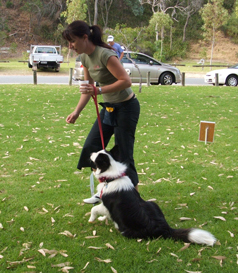 Accredited dogs are expected to display sound temperament and respond calmly in a range of situations. Accredited handlers will be required to communicate courteously and sensitively with a wide range of people, including those with disabilities. You and your dog will be asked to attend a Team Assessment. This short assessment (approximately 15 minutes) is conducted in a friendly, relaxed atmosphere and judges basic “good manners” and temperament in order to determine suitability for our visiting program. You will be required to attend a half-day seminar to learn more about the organisation, what to expect while visiting, and what is expected of you in return. The seminar also provides an opportunity for us to meet one another, answer questions and offer support. Once accredited, you will be offered a facility to visit. Where possible we try to place teams at facilities close to where they live. A “buddy” will accompany you on your first visit to your new facility. You may also like to observe an experienced team visiting their own facility before you begin visiting. We currently hold 2 team assessments and 1 seminar each year.